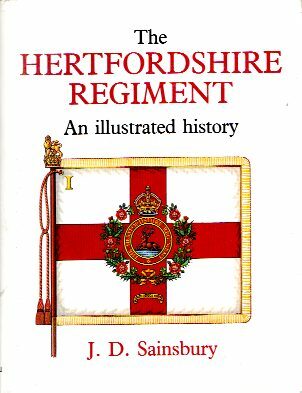 The Hertfordshire Regiment was formed in 1908 from two battalions of Volunteers then existing in the county, which themselves traced their origins to the raising of Rifle Volunteer Corps in 1859-60. In 1961 it proved no longer possible for the regiment to retain its exclusively Hertfordshire title or its unusual constitution as a regiment of infantry of the line represented only in the Territorial Army. Such is the nature of Britain's volunteer forces, however, that the direct descendants of the Hertfordshire Regiment soldier is the present day Territorial Army with almost 130 years continuous service to their credit. Two important themes run through this book - the regiment's struggle for survival in peacetime and, as if in justification of that struggle, the toil, sacrifice and achievement of officers and men in two world wars. Without claiming to be a 'complete' history, it guides the reader through the complexities of raisings, amalgamations and disbandments and traces the resulting changes in uniform and badges, especially through the illustrations. It records for the first time in a single volume the essentials of the regiment's campaigns and suggested where those who wish to find out more may be able to do so. 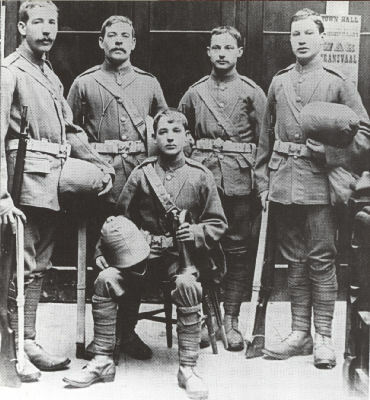 A group of volunteers from Berkhamsted before departure for South Africa in 1900. They are wearing the khaki service uniform laid down in Army Order 29 of 1900 (and appear not yet to have mastered the art of applying their puttees, which had not previously been issued to Volunteer infantry). Conditions in South Africa quickly dictated a change from the white belts and rifle slings shown here to khaki. This is a well produced book which is an excellent reference work for anyone researching the Hertfordshire Regiment.